Prince William, 34, nearly missed his granny's visit. He was called out on a medical emergency in north-west Norfolk in the morning with his crew of co-pilot, doctor, and critical care paramedic, and only returned to base 20 minutes before she arrived. The Duke of Cambridge, who aims to work around 80 hours a month for the charity, has been based at the airport for more than a year. He kissed his grandparents on both cheeks when they arrived and the Queen, 90, said: "You're only just back." William replied: "Yes, we just made it." 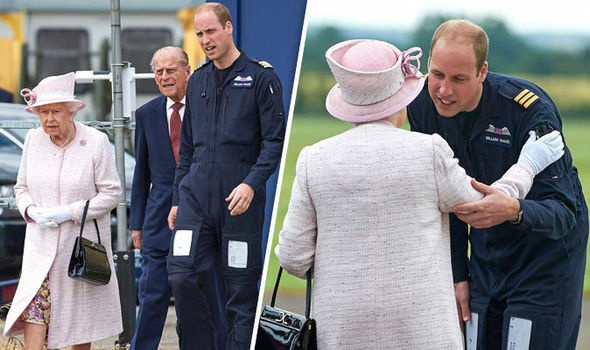 He told Philip, 95, he had spotted the royal couple 's helicopter in mid-air after his crew had been called out to the earlier incident in King's Lynn, about nine miles from the Queen's Sandringham estate. On the tarmac outside, he showed his grandparents around the H145 helicopter he flies and introduced them to his fellow crew members before the couple met charity volunteers, patients, and support staff. The Queen was charmed by a young Casanova -- two-year-old Pepe Casanova, a former patient who presented her with a posy of traditional English flowers including cornflower, sweet peas, and scabious. Pepe's mother, Ana, 41, told how a crew from the air ambulance service saved her son's life when he was five months old after he lost consciousness at their home in Wymondham, Norfolk. A GP had diagnosed a sickness bug and they thought he was sleeping it off but when they realised something more serious was wrong they dialled 999 and an air ambulance crew, with Dr Daniel Kornhall and critical-care paramedic Andy Downes on board was deployed. Pepe was suffering from multiple organ failure as a result of undiagnosed Type 1 diabetes and was close to death before they treated him at the scene. Mrs Casanova said: "When somebody steps in and saves your child's life in front of your eyes, you just can't put that into words." William's air ambulance colleague Dr Pam Chrispin, 57, said their famous pilot was just another crew member. She said: "William is a great pilot, he's a charming person, but most importantly he's a really great team player. Dr Chrispin has been with the EAAA for nine years but despite not flying with William, as he is based in Cambridge while she is at the charity's other centre in Norwich, they have worked together. She revealed the air ambulance's close-knit colleagues welcomed their royal pilot with a special present. She said: "We got him a mug before he arrived and it says will.i.am. I wasn't around when he received it but I'm sure he's pleased just to have his own mug. "It's a bit embarrassing. Jemma one of the paramedics and I - she's Princess Jemma and I'm Princess Pammie -and we have mugs with those names, but he doesn't mind." After a kiss on both cheeks for each of them from William, the Queen and Philip flew straight from the airport by royal helicopter to Buckingham Palace so that the monarch could meet her outgoing Prime Minister David Cameron and then his replacement Theresa May later. Queen's Speech 2015: "The world has had to confront moments of darkness this year"